Price is plus $90 Title Fee, $30.25 OHV Permit, and applicable tax. 8000 2-Stroke Engine: 160-class HP makes this 794cc 2-stroke the most powerful 800 engine in the industry. It features a lightweight, quick-revving crankshaft, twin spark plugs per cylinder and weight-saving engine reverse technology. The engine knock sensor provides octane recognition, giving you more fuel options. Arctic Drive System with TEAM Clutches: New for 2016, the Arctic Drive System™ incorporates a large TEAM BOSS driven clutch and TEAM drive clutch. By eliminating belt skid, these clutches reduce temperature and transfer more power to the track. In addition to their incredible strength, these clutches are known for their easy and precise tuning. FLOAT-ACTION Rear Suspension: Unique tri-hub rear axle system is engineered to be very light and very strong. Front-arm FOX FLOAT® 3 EVOL and rear-arm FOX FLOAT 3 EVOL R shocks provide lightweight strength and infinite adjustability for a precise ride. 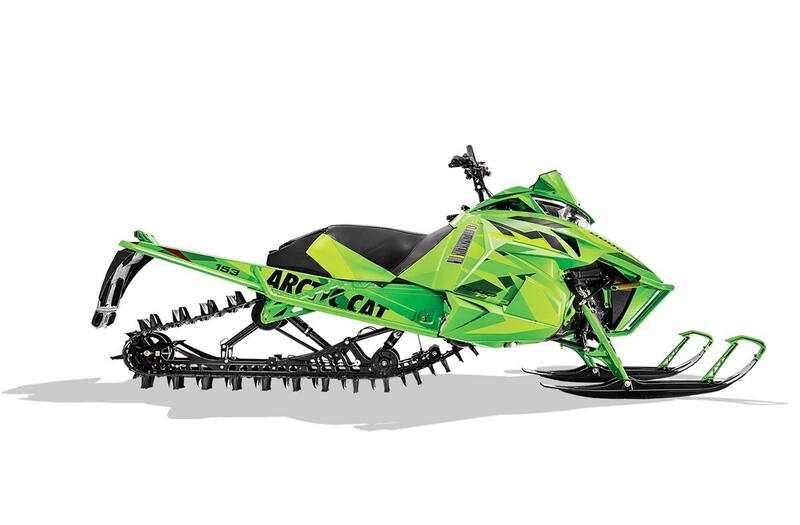 Arctic Mountain Front Suspension: Arctic Mountain Suspension (AMS) is all-new for 2016, from it’s single-post spindles set to a 27-degree caster angle for better sidehilling, to the 2.4-lb. weight savings in the A-arms and 7-in. tapered skis. All that plus a narrower 36-in. stance. FOX® 3 EVOL shocks cushion aggressive bumps and smooth out even the harshest ruts. Narrower 35.5-38.5 Adjustable Ski Stance: The narrower ski stance (adjustable: 35.5-in.-38.5-in.) makes it easier to pick your line and own it. It’s easier to carve, easier to initiate a sidehill, easier to navigate through the trees. And it’s never been easier to handle. ProClimb - 7 Skis: The new ProClimb-7 mountain ski is 7-in. at the tip, tapering to 6.5-in. at the center. The wider skis enhance your carving abilities and prevent unintended braking while going downhill. A wider ski damper featuring a longer axle and bolt increases lateral adjustability. Push-Button Engine Reverse: The push-button reverse is all about quick, easy activation. This feature reverses the direction of the engine rotation. In addition to being smooth, it’s also a weight-savings feature. 12V Outlet: Plug in and power up. Charge your phone or other electronic device while you ride. Deluxe Digital Analog Gauge: The deluxe gauge lets you choose between digital and analog speed, and tachometer readouts. There’s also an odometer, two trip meters, engine hour meter, reverse indicator, optional altimeter and warning lights. ProClimb Front Bumper: These lightweight aluminum bumpers add superior protection and a bold, stylish look. The powder-coated finish provides a scratch-resistant, shinny look. Goggle Holder: Heat from the engine dries your goggles while you ride, so you always have a dry, warm pair of goggles waiting. Vertical Steering Post, 4.5" Riser with Mountain Handlebar: The 4.5? vertical post delivers a more natural handlebar turning arc for a standing rider who wants to countersteer on steep sidehills. HCR-type Heat Exchanger: The unit is nearly 4 lbs. lighter than the full-length heat exchanger, and it eliminates additional weight by reducing snow buildup. This system has been proven on the HCR for the past three seasons. Ice Scratchers: As a part of the heat-exchange system, these ice scratchers are simply invaluable. When there’s minimal snow, just lower the ice scratchers to kick up some snow and ice. This will keep the engine cool to prevent overheating. Mountain Strap: Provides extra leverage when you need it most. 5.5" Race-Height Windshield: Because it’s not the same hiding behind a tall windshield as you carve through fresh power. 153-in. Power Claw Track with 3-in. Lugs: This lightweight, 153-in. single-ply track sets the standard for deep snow performance. Stagger-set, curved-forward paddle towers won’t fold over. The new industry-leading 3-in. lugs grip the powder like no other. Clutch Calibration: 6,000 - 8,000 ft. Ski Type / Width: ProClimb - 7 in.